We’re used to hearing about Antifa and radical left-wing activists attacking conservatives and pro-Trump supporters. 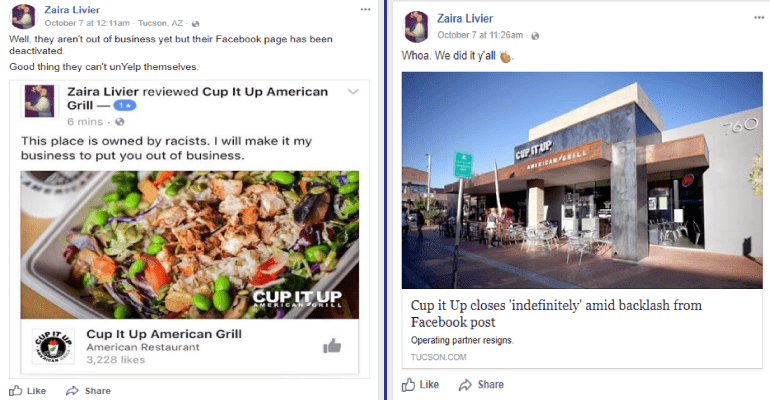 But now they’re taking it to a new level, attempting to destroy a conservative news site—yeah, the free press—that exposed their efforts putting a restaurant out of business over the eatery’s one pro-Trump, pro-conservative post on Facebook. Cup It Up American Grill posted the message on its Facebook page on Friday, October 6. It contained merely standard conservative positions, including supporting President Trump, standing for the national anthem, supporting “In God We Trust” and “The Bill of Rights.” The post stated the business didn’t believe in or support [the violent left-wing group] Antifa, kneeling for the national anthem, fake news, political correctness and global warming. Nothing more controversial than that. Led by Livier, the progressives went wild with rage over the article. They launched a campaign threatening ADI’s advertisers. They told activists to complain to the Arizona Newspaper Association in an apparent effort to get the organization to drop ADI as a member. They instructed people to give ADI low ratings on Facebook, reporting its articles as fake news. Ironically, Livier has been complaining on social media that she’s been attacked for attacking Cup It Up. She can dish it out but she can’t take it. Squelching free speech and news organizations because she can’t take criticism isn’t going to work. The left attacks President Trump for suggesting that dishonest news media be shut down, yet they hypocritically have no problem shutting down conservative news media themselves? Free speech patriots fought back. Conservative Tucson talk show host James T. Harris, who has a huge online following, spread news of the attack on his show and on social media. Before all this took place, ADI had a rating of five out of five stars on Facebook. The progressives brought it down to one and a half stars. After news of the attack went viral due to Harris, it came back up to almost four stars. The activists noticed and whined that ADI went from only two 5-star Facebook reviews to 63 within a day. Shutting down a business merely for its politically conservative viewpoints is a step toward totalitarianism. The progressives may have gotten away with that, but they won’t get away with suppressing the freedom of the press. In another instance of irony, Livier’s attempts to squelch negative publicity about her actions have resulted in blowing up those actions virally. She will forever be known not just for what she did to this poor restaurant but how she tried — and failed — to shut down the freedom of the press.